Thick, hearty chili loaded with tender beef and seasonal veggies. This is comfort food at its best! The temperature is slowly beginning to drop. There’s a gentle breeze throughout the day that slowly transitions into colder evenings with that crisp fall scent I look forward to all year long. Fall is my absolute favorite season. The air is crisp and fresh, and at night it’s tinged with the smoky scent of bonfires. With the cooler weather creeping in, soup making is fair game. I’ve also busted out my fall candles, throw blankets, and slippers. I also stocked up on canned pumpkin. Bring it, fall! These harvest chili bowls are full of tender beef and seasonal veggies straight from my garden. If your garden is anything like my garden, then you have plenty of zucchini and squash to spare. This chili is thick, hearty, and filling, and it comes together in under 45 minutes in one pot. Less dishes is always welcome in my house on a busy weeknight. I loaded the pot with a variety of veggies: zucchini, squash, red and green peppers, jalapeño peppers, and sweet corn. It’s basically a tribute to the end of summer. I topped each bowl with freshly grated cheese, sour cream, and chopped scallions for an added boost of flavor. If you’re a veggie lover, this chili is for you. Let beef inspire your next meal. 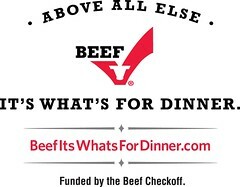 For more beef recipes and inspiration, follow The Beef Checkoff on Pinterest, Twitter, and Facebook. Thick, hearty chili loaded with tender beef and seasonal veggies. Heat 1 tablespoon of olive oil in a large pot over medium-high heat. Add the ground beef and a generous pinch of salt and pepper. Brown the beef, breaking it up with a spatula or wooden spoon as it cooks, until it is no longer pink. Add the peppers, onions, and garlic. Cook until tender, about 5 minutes. Add the zucchini and squash and cook for an additional 5 minutes. Turn the heat down to medium-low and stir in the tomato sauce, diced tomatoes, beans, corn, and spices. Cover and cook 30 minutes, stirring occasionally. Disclosure: This post was sponsored by The Beef Checkoff. All opinions are my own. Wonderful chili Jennie and I love that zucchini and squash is in it. Such a nice change up from the usual chili. Thank you so much, Renee! This was by far my favorite chili recipe. It’s definitely due to all of the veggies. LOVE this! I love that fall is coming and am so ready for warm, comforting meals like this. Love all them veggies and beans…it looks soooo thick and inviting! Will definitely be whipping this up lickety split! It’s like a warm blanket, only edible. What a delicious and flavour filled dish! These chili bowls look so hearty and perfect for the weather we’re having here in Australia, I definitely will be recreating the recipe! Thanks, Thalia! Chili is a cold weather must. This chili looks fantastic and I hoping for cooler weather soon to enjoy it with. I can’t wait for it too cool down. Mother Nature teased us last week, but today it’s back up in the 80’s. Thank you so much, Marla. You are so good at bridging the gap between summer and fall! Chili = fall and veggies = summer and you nailed them both. #jealous errrr ready to faceplant in a bowl of this. Love how thick and hearty it is! I thought it would be a good way to transition into cooler weather. Thanks, Mary Frances. I love all the veggies but the tender beef gives it extra yumminess. Gorgeous photos, delicious chili, sounds like a great day to me! Pinned x 3! Love all the squash in this chili. I think it would be great to save for next summer too on a chilly nut (seriously no pun). Thanks, Susan. I have squash coming out the wazoo. Perfect comfort food for fall! Also, I love that bowl the chili is in! Thank you so much, Kelly. The bowl is from Home Goods. This chili looks like the perfect way to transition from summer to fall! Thanks, Jess. I had to use up all of my summer veggies from the garden. Chili seemed like the perfect vessel. I love that the weather is finally starting to get just a tad bit cooler because that means I can make lots of chili! This sounds delicious! And adorable little bowl – it’s so cute! Chili is perfect for cooler weather. Thank you so much, Ashley. The bowl is from Home Goods–love that place! If fall means more bowls of chili like this – I’m ready! This sounds like comfort in a bowl. Delish! Our weather went from sunny ‘n hot to cold ‘n dreary like boom! Everyone at my office is wearing big ol’ sweaters today. A giant bowl of this hearty, comforting, delicious chili would be perfect right about now! I can’t wait to bust out my over-sized sweaters. Thanks, Nancy! Fall is my favorite too and these harvest chili bowls look like the best way to welcome it. And I love your beautiful blue bowl too!